ADF culture has improved enormously over the last 30 years and while there remains more to be done, Christians should be the ‘salt’ to assist and drive this change across the ADF. Being a good Christian in the ADF and today’s world is not easy, but if you evangelise in God’s strength, then anything is possible. I find it difficult being a Christian in the ADF, which is a very different organisation to the one I joined. The ADF leadership have done an enormous amount to change the culture and the values over the past 10 years, but there are still vast areas of darkness in the ADF. Christians have got to be that ‘shaft of light’ wherever we are. Let’s begin by talking about two biblical warriors – Moses and Gideon. These men both did big things, but were very reluctant and actually debated with God. I am really encouraged by the thought of the debates that Moses and Gideon had with God. Exodus 3:12a God said; ‘I will be with you.’ This was God’s assurance to Moses that everything was going to be OK and that is the thing I want everyone to remember. Exodus 3:12b ‘And this will be the sign to you that it is I who have sent you: When you have brought the people out of Egypt, you will worship God on this mountain.’ Which they did and you all know the story, but I just want to briefly talk about the discussion or debate that Moses has with God. I actually feel a bit like Moses. I did an interview with a journalist, he sent me the transcript and it took me two hours to rewrite it because I obviously don’t interview very well. I can see where Moses was going with this. Exodus 4:10b ‘I am slow of speech and tongue.’ To which the Lord says: ‘Hey, I gave those people everything’ and he goes on to explain that he will bring Aaron, Moses’ brother, in who will assist. (Exodus 4: 11-17) The debate continues on though. Exodus 6:12 But Moses said to the Lord; ‘If the Israelites will not listen to me, why would Pharaoh listen to me, since I speak with faltering lips.’ He’s saying; ‘It’s just not going to work, I’m sorry.’ This was a very big thing bringing a nation out of Eqypt, wander around a bit, and then end up in the land flowing with milk and honey. Let’s consider Gideon now; Gideon is a favourite of mine. There were about four different nations that had invaded and were having a wonderful time in Israel at this time. Gideon was a ‘nobody’ in Israel and even in his own family. And God will also be with us. A bit later on Gideon tests God. There are only a few examples in the Bible of God being tested and this is one of them. And that is what happened. Gideon rose early the next day; he squeezed the fleece and wrung out the dew—a bowlful of water. But even that is not good enough for Gideon. This is no ‘request’, it’s a test for God, courtesy of Gideon. I believe that this is encouraging for us as God ended up winnowing out his people and the ones that lapped out of the stream, 300 of them, in God’s strength defeated the Midianites. 300 against what some estimates suggest is somewhere between 10,000 – 40,000. In a military context, God used Gideon and his 300 to sow discord and make the various enemies fight among themselves – very easy for God to do, but not so easy for man to do. It was an excellent military victory; God can do it and we can do it with God there with us. Moses and Gideon are both very instructive and very encouraging for me. While it may be difficult being that shaft of light in a Defence context, these stories encourage me and they should also encourage you. Being a member of the ADF and being a member of society at present isn’t that easy. When you use that strength and courage that God gives you and remember his strength, remember that you can be courageous – step out in faith. I have some suggestions here for us in our daily life as a way of demonstrating to people around you how to be that ‘shaft of light’. Be a great example – A ‘do as I say, not as I do’ approach rarely works! If you are a great example for those around you, in everything, from the way you organise your travel to the way you talk to people, people will notice. You might be very senior to somebody, but that does not mean that you can talk down to them. You might be very junior to somebody else but you don’t talk about them behind their back. These might seem like little things, but be a good example in everything you do. People notice how you act, and once you’ve identified yourself as a Christian, they notice even more. Integrity – Be responsible for your actions, people watch. Integrity is very important and is one of the values of our Defence Organisation. Be accountable for what you do and say. Humility – is even more important. It is really easy not be humble, but if we are humble it counts for so much. You don’t have to shout, you can get your message across by being calm, quiet and humble – people will notice. Take the time to know those around you – Be empathetic with people and take the time to understand and know them. My analogy here is if you drive to Sydney at 110 km/h you don’t see much, you just blast down that freeway. At 15 km/h (I’m a mountain biker and this is an average speed during a long race), you’d see a lot more. If you walk around at 5km/h, you see even more still. When you slow down and take the time to actually talk to people, you learn things about people’s lives, then you can use that to further God’s kingdom. Know yourself – You have got to know what sort of a person you are and how you relate to other people so that you can be a better instrument for God. If you know whether you are an encourager, a leader or an administrator; use that skill to further God’s kingdom. Give it 110% all the time – be enthusiastic, people really notice that. It is all too easy to just sit there and let things happen, but if you are constantly enthusiastic, you are one of the few people around who is. Be able to say ‘sorry’ and ‘I was wrong’ – You will be the winner and you’ll be amazed at how far that gets you with people. Saying; ‘I’m sorry’ helps because I’m not right all the time, nobody is. Have a support network – have people praying for you and be able to bounce thoughts and ideas off Christian friends. It doesn’t matter who you are or what you do, everyone needs a support network and having people pray for you. Your approach is important – Meekness is not a common attribute of Defence people, but being meek is good and it works. You can be quiet, pleasant and measured. You do not need to shout. Be grateful – for the things that people do for you. If you take the time to know people and build that relationship, when they do something for you and you are grateful for it, it builds up into a very pleasant environment that God can work in. Let them know you are a Christian – Find some way to let them know. You point out; “Actually I don’t appreciate you saying that”, “My stand on this is…” or establish a boundary. Draw a line and be consistent – It helps people understand you and it might help them understand why you are the way you are. People will respect you, but you then have to be very aware that you will be watched – very closely. That is accountability. We have lots of opportunities to demonstrate our Christianity in Defence. We have performance agreements with uniformed and non-uniformed people at least twice a year, sometimes more; that’s an opportunity. Morning tea is another opportunity, as are counselling sessions, briefs, soldier’s fives or whatever else. You don’t need to ‘Bible bash’ or be Billy Graham, but if you think about it and plan, you can use these opportunities to effectively increase God’s kingdom. Take the opportunity; anything is possible with God. Be that shaft of light in the surrounding darkness. I just want to share a personal experience which is part of my testimony. It’s a long story so I won’t tell the all of it, but I came to Christ on the back of a warship on the way back from Gulf War 1. It was quite a tense period and difficult, but God managed to place me in a helicopter crew of 3 where the other 2 were Christians. I had been a religious person all my life, we’d done Bible studies but I still did not have a personal relationship with Jesus. I was asleep in bed and, for those of you who aren’t familiar with life on a ship, you don’t use alarm clocks because they disturb everyone around you. Instead, you work on a system of ‘shakes’. You make sure the bridge knows that you need to wake up at a certain time and they come along and make sure you are awake – dragging you out of bed if need be! That’s the routine we set up. That is the short version of a long story. Since then, I’ve been a slowly developing Christian and, perhaps sometime so slow that God is frustrated, but we are working on it. Big things are great, but it is the little things with God’s help that will help you the most to be a good Christian in the ADF. If you think you can release China’s political prisoners, then great. If God puts that on your heart, then I reckon you could do it. What I’m saying to you today is that a bunch of little things will be a good start. It will help your environment, the people around you and it will help God and his kingdom. So if you can be that shaft of light, like that shaft of light that hit me in the early morning gloom on the flight deck, then I think that will be a great thing. Where ever you are, God will be glorified by anything that you might then do. I’ve been a part assistant in bringing a few people to the Lord in the last few years and that’s always a great thing. You don’t always know and you’re not always that person to actually bring them to the Lord, but you are at least a part of the process. 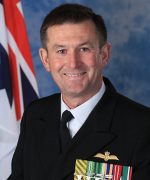 The following article is based on RADM Campbell’s presentation at the MCF Seminar in 2013 and was published in the Crossfire Magazine no.25 – June 2014.